A capacitor is a two-terminal, electrical component. Along with resistors and inductors, they are one of the most fundamental passive components we use. You would have to look very hard to find a circuit which didn't have a capacitor in it. What makes capacitors special is their ability to store energy; they're like a fully charged electric battery. 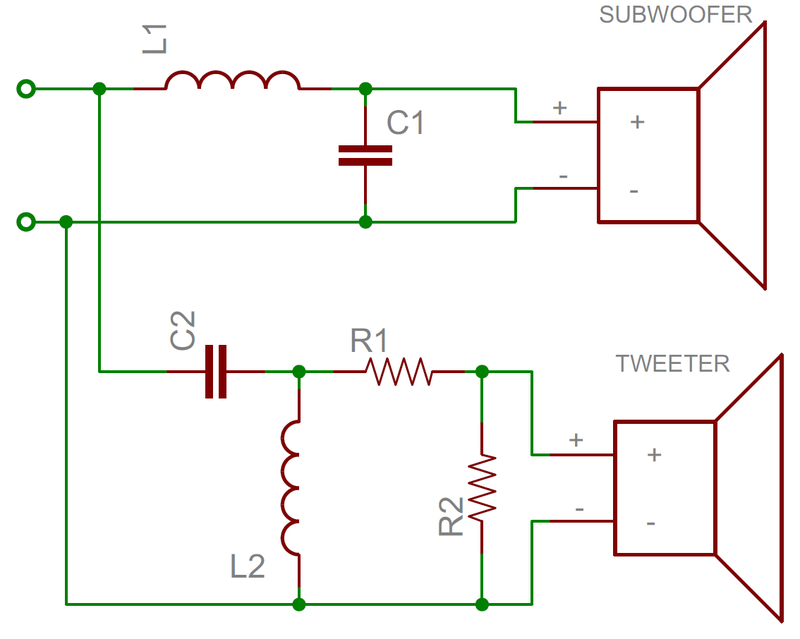 Caps, as we usually refer to them, have all sorts of critical applications in circuits. Common applications include local energy storage, voltage spike suppression, and complex signal filtering. (1) and (2) are standard capacitor circuit symbols. (3) is an example of capacitors symbols in action in a voltage regulator circuit. The symbol with the curved line (#2 in the photo above) indicates that the capacitor is polarized, meaning it's probably an electrolytic capacitor. More on that in the types of capacitors section of this tutorial. Not all capacitors are created equal. Each capacitor is built to have a specific amount of capacitance. The capacitance of a capacitor tells you how much charge it can store, more capacitance means more capacity to store charge. The standard unit of capacitance is called the farad, which is abbreviated F.
It turns out that a farad is a lot of capacitance, even 0.001F (1 milifarad -- 1mF) is a big capacitor. Usually you'll see capacitors rated in the pico- (10-12) to microfarad (10-6) range. 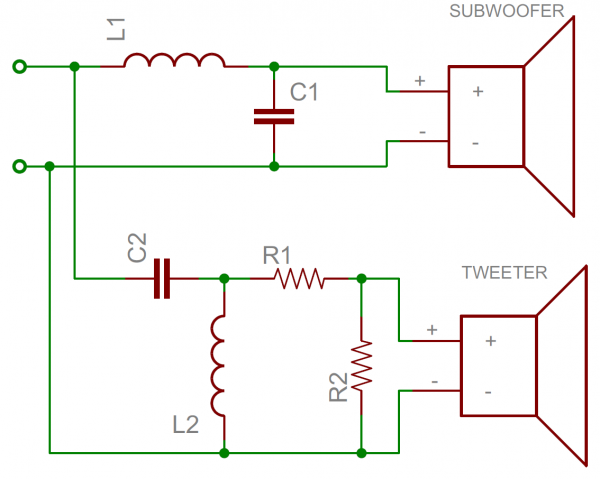 When you get into the farad to kilofarad range of capacitance, you start talking about special caps called super or ultra-capacitors. Note: The stuff on this page isn't completely critical for electronics beginners to understand...and it gets a little complicated towards the end. We recommend reading the How a Capacitor is Made section, the others could probably be skipped if they give you a headache. The schematic symbol for a capacitor actually closely resembles how it's made. 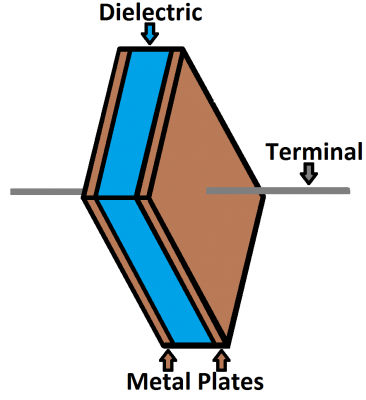 A capacitor is created out of two metal plates and an insulating material called a dielectric. The metal plates are placed very close to each other, in parallel, but the dielectric sits between them to make sure they don't touch. Your standard capacitor sandwich: two metal plates separated by an insulating dielectric. The dielectric can be made out of all sorts of insulating materials: paper, glass, rubber, ceramic, plastic, or anything that will impede the flow of current. The plates are made of a conductive material: aluminum, tantalum, silver, or other metals. They're each connected to a terminal wire, which is what eventually connects to the rest of the circuit. 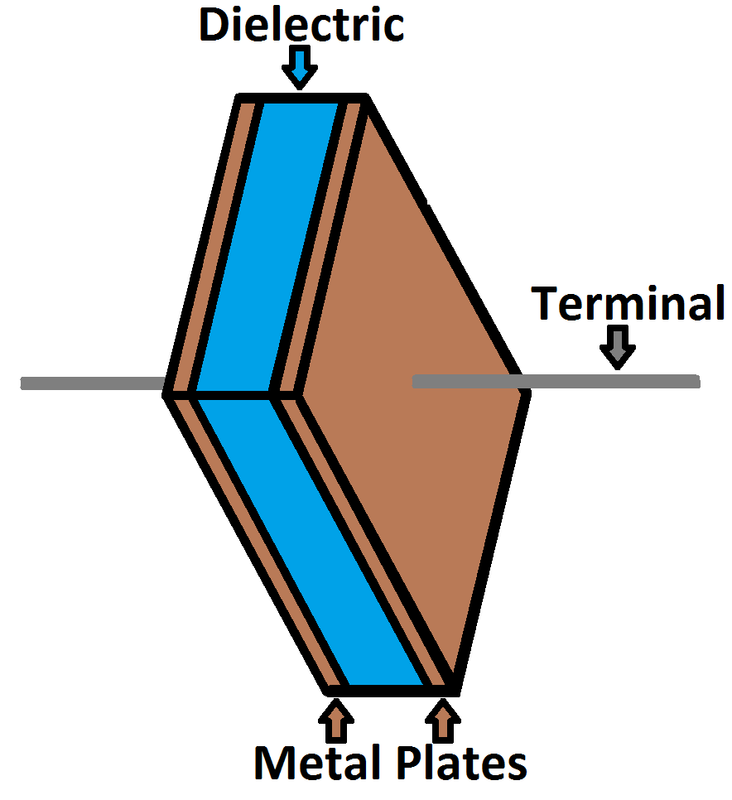 Where εr is the dielectric's relative permittivity (a constant value determined by the dielectric material), A is the amount of area the plates overlap each other, and d is the distance between the plates. Electric current is the flow of electric charge, which is what electrical components harness to light up, or spin, or do whatever they do. When current flows into a capacitor, the charges get "stuck" on the plates because they can't get past the insulating dielectric. Electrons -- negatively charged particles -- are sucked into one of the plates, and it becomes overall negatively charged. The large mass of negative charges on one plate pushes away like charges on the other plate, making it positively charged. The positive and negative charges on each of these plates attract each other, because that's what opposite charges do. But, with the dielectric sitting between them, as much as they want to come together, the charges will forever be stuck on the plate (until they have somewhere else to go). The stationary charges on these plates create an electric field, which influence electric potential energy and voltage. When charges group together on a capacitor like this, the cap is storing electric energy just as a battery might store chemical energy. When positive and negative charges coalesce on the capacitor plates, the capacitor becomes charged. A capacitor can retain its electric field -- hold its charge -- because the positive and negative charges on each of the plates attract each other but never reach each other. At some point the capacitor plates will be so full of charges that they just can't accept any more. There are enough negative charges on one plate that they can repel any others that try to join. This is where the capacitance (farads) of a capacitor comes into play, which tells you the maximum amount of charge the cap can store. If a path in the circuit is created, which allows the charges to find another path to each other, they'll leave the capacitor, and it will discharge. For example, in the circuit below, a battery can be used to induce an electric potential across the capacitor. This will cause equal but opposite charges to build up on each of the plates, until they're so full they repel any more current from flowing. 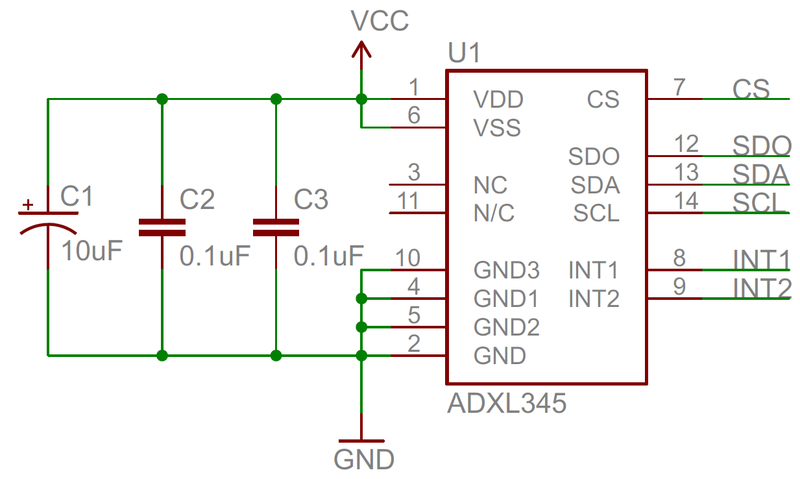 An LED placed in series with the cap could provide a path for the current, and the energy stored in the capacitor could be used to briefly illuminate the LED. Charge (Q) stored in a capacitor is the product of its capacitance (C) and the voltage (V) applied to it. The capacitance of a capacitor should always be a constant, known value. So we can adjust voltage to increase or decrease the cap's charge. More voltage means more charge, less voltage...less charge. That equation also gives us a good way to define the value of one farad. One farad (F) is the capacity to store one unit of energy (coulombs) per every one volt. We can take the charge/voltage/capacitance equation a step further to find out how capacitance and voltage affect current, because current is the rate of flow of charge. The gist of a capacitor's relationship to voltage and current is this: the amount of current through a capacitor depends on both the capacitance and how quickly the voltage is rising or falling. 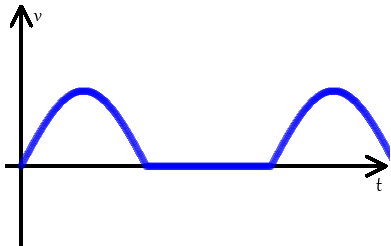 If the voltage across a capacitor swiftly rises, a large positive current will be induced through the capacitor. 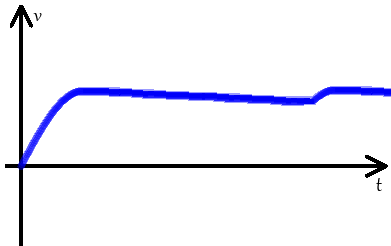 A slower rise in voltage across a capacitor equates to a smaller current through it. If the voltage across a capacitor is steady and unchanging, no current will go through it. The dV/dt part of that equation is a derivative (a fancy way of saying instantaneous rate) of voltage over time, it's equivalent to saying "how fast is voltage going up or down at this very moment". The big takeaway from this equation is that if voltage is steady, the derivative is zero, which means current is also zero. This is why current cannot flow through a capacitor holding a steady, DC voltage. Size - Size both in terms of physical volume and capacitance. 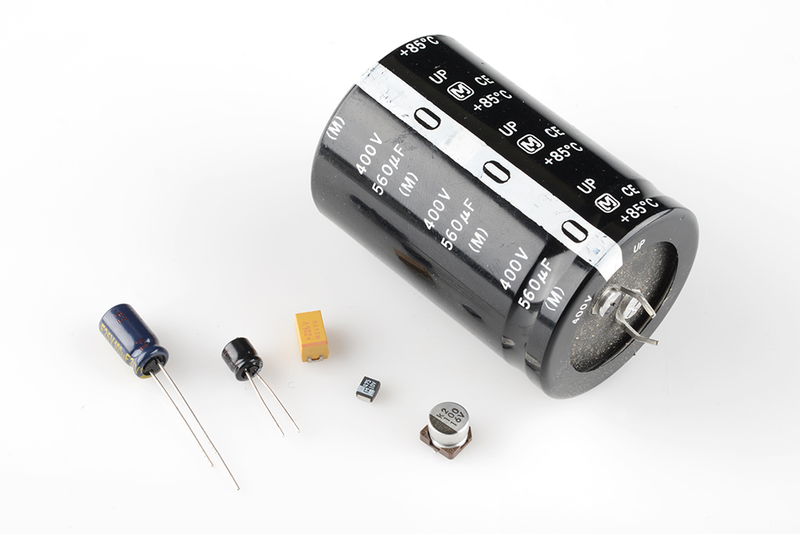 It's not uncommon for a capacitor to be the largest component in a circuit. They can also be very tiny. More capacitance typically requires a larger capacitor. Maximum voltage - Each capacitor is rated for a maximum voltage that can be dropped across it. Some capacitors might be rated for 1.5V, others might be rated for 100V. Exceeding the maximum voltage will usually result in destroying the capacitor. Leakage current - Capacitors aren't perfect. Every cap is prone to leaking some tiny amount of current through the dielectric, from one terminal to the other. This tiny current loss (usually nanoamps or less) is called leakage. Leakage causes energy stored in the capacitor to slowly, but surely drain away. Equivalent series resistance (ESR) - The terminals of a capacitor aren't 100% conductive, they'll always have a tiny amount of resistance (usually less than 0.01&ohm;) to them. 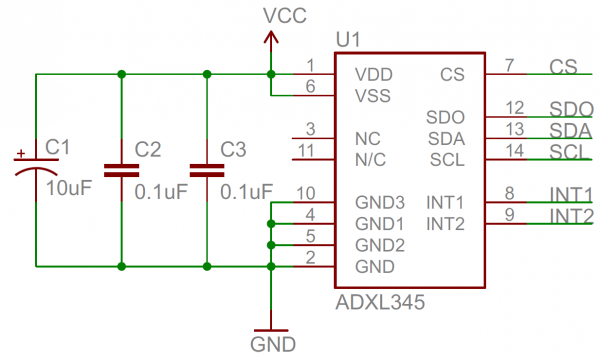 This resistance becomes a problem when a lot of current runs through the cap, producing heat and power loss. Tolerance - Capacitors also can't be made to have an exact, precise capacitance. Each cap will be rated for their nominal capacitance, but, depending on the type, the exact value might vary anywhere from ±1% to ±20% of the desired value. The most commonly used and produced capacitor out there is the ceramic capacitor. The name comes from the material from which their dielectric is made. Ceramic capacitors are usually both physically and capacitance-wise small. It's hard to find a ceramic capacitor much larger than 10µF. A surface-mount ceramic cap is commonly found in a tiny 0402 (0.4mm x 0.2mm), 0603 (0.6mm x 0.3mm) or 0805 package. Through-hole ceramic caps usually look like small (commonly yellow or red) bulbs, with two protruding terminals. Two caps in a through-hole, radial package; a 22pF cap on the left, and a 0.1µF on the right. In the middle, a tiny 0.1µF 0603 surface-mount cap. 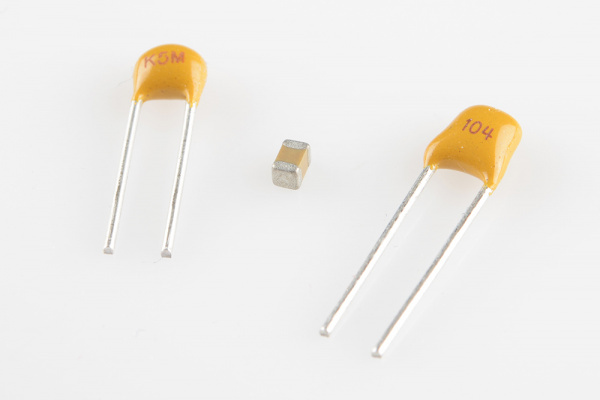 Compared to the equally popular electrolytic caps, ceramics are a more near-ideal capacitor (much lower ESR and leakage currents), but their small capacitance can be limiting. They are usually the least expensive option too. These caps are well-suited for high-frequency coupling and decoupling applications. Electrolytics are great because they can pack a lot of capacitance into a relatively small volume. If you need a capacitor in the range of 1µF-1mF, you're most likely to find it in an electrolytic form. They're especially well suited to high-voltage applications because of their relatively high maximum voltage ratings. Aluminum electrolytic capacitors, the most popular of the electrolytic family, usually look like little tin cans, with both leads extending from the bottom. An assortment of through-hole and surface-mount electrolytic capacitors. Notice each has some method for marking the cathode (negative lead). Unfortunately, electrolytic caps are usually polarized. They have a positive pin -- the anode -- and a negative pin called the cathode. When voltage is applied to an electrolytic cap, the anode must be at a higher voltage than the cathode. The cathode of an electrolytic capacitor is usually identified with a '-' marking, and a colored strip on the case. The leg of the anode might also be slightly longer as another indication. If voltage is applied in reverse on an electrolytic cap, they'll fail spectacularly (making a pop and bursting open), and permanently. After popping an electrolytic will behave like a short circuit. These caps also notorious for leakage -- allowing small amounts of current (on the order of nA) to run through the dielectric from one terminal to the other. This makes electrolytic caps less-than-ideal for energy storage, which is unfortunate given their high capacity and voltage rating. 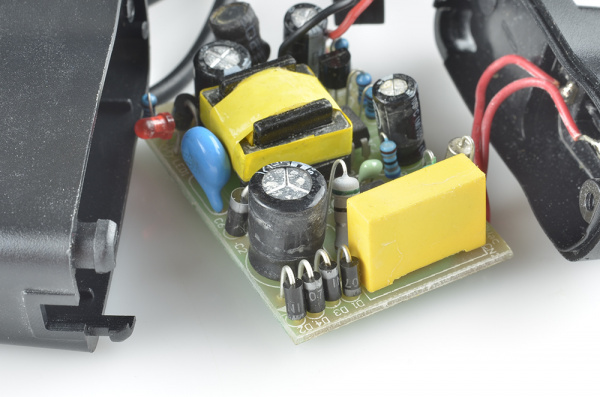 If you're looking for a capacitor made to store energy, look no further than supercapacitors. These caps are uniquely designed to have very high capacitances, in the range of farads. A 1F (!) supercapacitor. High capacitance, but only rated for 2.5V. Notice these are also polarized. While they can store a huge amount of charge, supercaps can't deal with very high voltages. 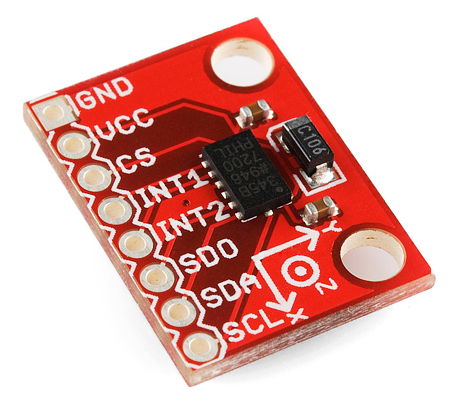 This 10F supercap is only rated for 2.5V max. Any more than that will destroy it. Super caps are commonly placed in series to achieve a higher voltage rating (while reducing total capacitance). The main application for supercapacitors is in storing and releasing energy, like batteries, which are their main competition. While supercaps can't hold as much energy as an equally sized battery, they can release it much faster, and they usually have a much longer lifespan. Electrolytic and ceramic caps cover about 80% of the capacitor types out there (and supercaps only about 2%, but they're super!). 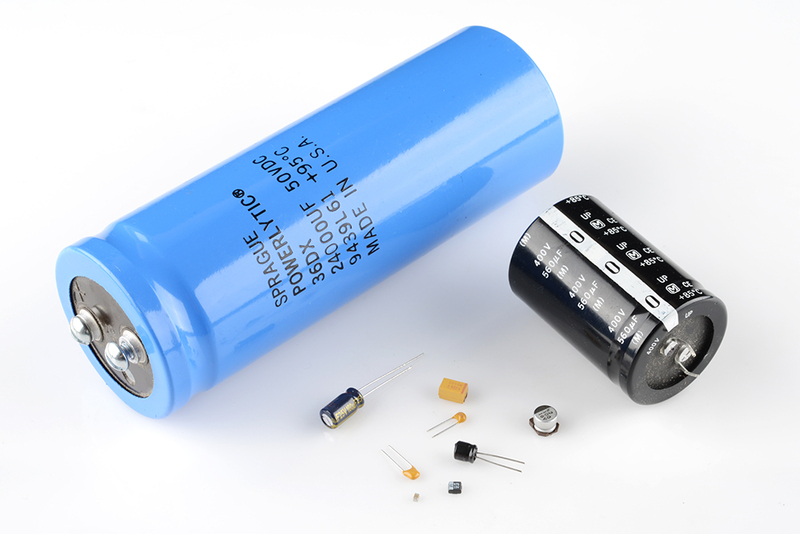 Another common capacitor type is the film capacitor, which features very low parasitic losses (ESR), making them great for dealing with very high currents. There's plenty of other less common capacitors. Variable capacitors can produce a range of capacitances, which makes them a good alternative to variable resistors in tuning circuits. Twisted wires or PCBs can create capacitance (sometimes undesired) because each consists of two conductors separated by an insulator. Leyden Jars -- a glass jar filled with and surrounded by conductors -- are the O.G. of the capacitor family. Finally, of course, flux capacitors (a strange combination of inductor and capacitor) are critical if you ever plan on traveling back to the glory days. Much like resistors, multiple capacitors can be combined in series or parallel to create a combined equivalent capacitance. Capacitors, however, add together in a way that's completely the opposite of resistors. When capacitors are placed in parallel with one another the total capacitance is simply the sum of all capacitances. This is analogous to the way resistors add when in series. So, for example, if you had three capacitors of values 10µF, 1µF, and 0.1µF in parallel, the total capacitance would be 11.1µF (10+1+0.1). Much like resistors are a pain to add in parallel, capacitors get funky when placed in series. The total capacitance of N capacitors in series is the inverse of the sum of all inverse capacitances. Taking that equation even further, if you have two equal-valued capacitors in series, the total capacitance is half of their value. For example two 10F supercapacitors in series will produce a total capacitance of 5F (it'll also have the benefit of doubling the voltage rating of the total capacitor, from 2.5V to 5V). Store up on these little energy storage components or put them to work a beginning power supply kit. Or maybe some of these tutorials will catch your attention?